Based on the blades used in ancient Rome, the Maximus Gladiator Sword is a fantastically detailed replica. 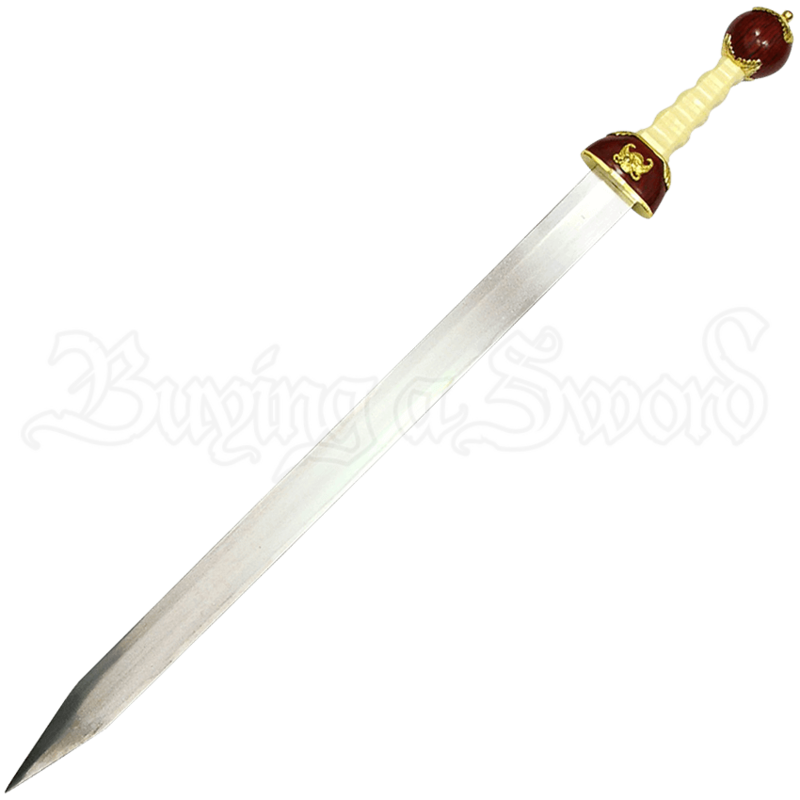 Its long, stainless steel blade tapers to a point, and its wooden handle features faux ivory and regal golden tone details. This Roman replica weapon has a cup shaped wooden guard with a golden mustachioed face decorating its surface. The ridged grip is made of a cream colored faux ivory material, and the spherical wooden pommel features golden leaf embellishments at its top and bottom. A matching wood and faux leather scabbard is included with this decorative gladiator sword, displaying a golden tone band at its throat and a matching endcap, embellished with the same face that appears on the guard. An ornate gold tone holster is attached at the center of the scabbard with straps attached for easy carrying and display. An outstanding sampling of ancient Rome weaponry and style, this decorative blade is an essential collectible for fans of antique history and sword collectors alike.